North Virginia experiences humid, warm summers and cold winters, although temperatures rarely fall below 0 degrees Fahrenheit. Falling into USDA Hardiness Zones 6 to 7, a variety of ground covers thrive in the region. Ground covers form a dense cover that helps control soil erosion. They also are used in places where grass remains difficult to grow. Some gardeners use ground covers to make their yard maintenance-free while adding beauty and texture to the landscape. Also known as moss pink, creeping phlox (Phlox subulata) works well as an evergreen ground cover in almost any soil type. Creeping phlox forms thick, dense mats of foliage that resemble moss. In the spring, the plant produces masses of white, pink, or purple flowers. The plant requires little water but grows best in full sun. If you plant phlox in rocky soil, it grows right over the rocks, giving the rocks a moss-covered look. In winter, the leaves may turn a bit brown due to the cold temperatures. Baltic English ivy (Hedera helix 'Baltica') handles freezing temperatures very well. The evergreen plant features dark-green glossy leaves with white veins running throughout. The ivy grows quickly and works well as a climbing vine, reaching up to 30 to 40 feet when mature. Plant Baltic English ivy in rich, loamy, well-drained soil in part to full shade. The plant also tolerates other soil types as long as they drain well. The drought-tolerant plant grows best if you let the soil dry out between watering. Plant ivy in the spring so it has time to establish its roots. If you must plant in the fall, do so at least a month before the first expected frost. The large leaves of the hosta (Hosta spp.) make it a great ground cover in areas with partial or full shade. Hostas come in a variety of shapes, sizes and shades of green. Some of the shorter hostas include Hosta ‘Gold Standard,’ which grows to 18 inches in height and sports leaves with dark green edges and a gold center. 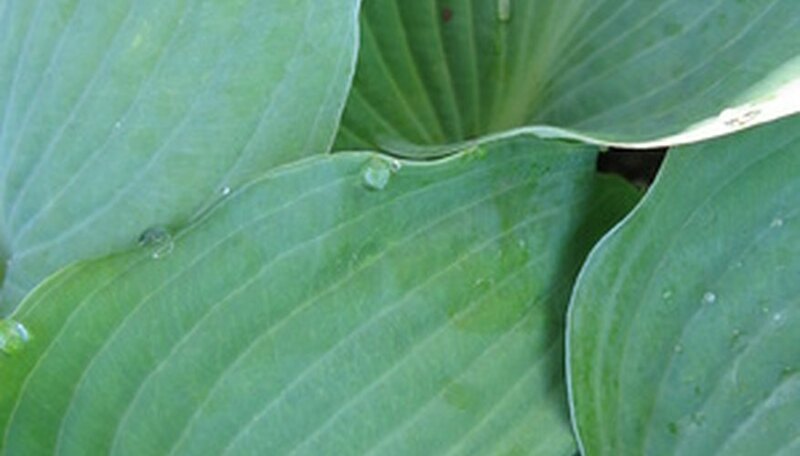 Hosta ‘June’ grows to 15 inches in height and produces leaves with a gold center and blue-green margins. Hostas prefer moist, slightly acidic soil. In the winter, the foliage dies back, with new foliage quickly growing in the spring. Fragrant hosta flowers appear mid-summer on the ends of thin, long stalks, and they are favorites of hummingbirds. Sedum (Sedum spp.) is a good choice for a ground cover in your rock garden. With more than 300 species and 500 cultivars of sedums in a variety of foliage colors, Northern Virginia gardeners get plenty of choices. The hardy, drought-resistant plants spread by rooting from broken branches or fallen leaves, making them easy to grow. The plant features thick, waxy evergreen leaves with masses of small pink, yellow or purple flowers appearing during the summer. Plant sedum in well-drained soil in full sun. Once planted, sedum requires little water; if the soil stays moist, the plants may rot and die.